1. 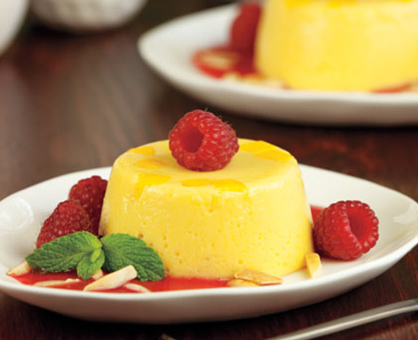 Prepare Panna Cotta: Place milk in medium saucepot and sprinkle gelatin over milk; let stand 5 minutes. Place saucepot over medium heat and whisk in sugar. Heat to simmering and remove saucepot from heat; cool 10 minutes. 2. Reserve 3/4 cup mango. In blender, purée remaining mango, yogurt, vanilla extract and milk mixture on high until smooth and creamy. Lightly spray six 8-ounce oven-safe ramekins with nonstick cooking spray and place on rimmed baking pan. Evenly divide reserved mango into bottom of ramekins, then pour puréed mango mixture (about 7 ounces each) over mangos. Refrigerate panna cotta at least 3 hours or up to overnight to set. 3. Prepare Raspberry Sauce: In blender, purée raspberries, orange juice, sugar and orange zest on high until smooth. Strain mixture through fine-mesh strainer; discard seeds. Makes about 3/4 cup. 4. To serve, carefully run a small knife around edge of ramekins to loosen panna cottas, then invert ramekins onto 6 dessert plates to release; spoon about 2 tablespoons raspberry sauce around panna cotta. Sprinkle each with 1 teaspoon almonds and garnish with whole raspberries, if desired.